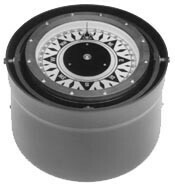 A compass, magnetic compass or mariner's compass is a navigational instrument for determining direction relative to the earth's magnetic poles. It consists of a magnetized pointer (usually marked on the North end) free to align itself with Earth's magnetic field. The face of the compass generally highlights the cardinal points of north, south, east and west. The compass greatly improved maritime trade by making travel safer and more efficient. A compass can be used to calculate heading, used with a sextant to calculate latitude, and with a marine chronometer to calculate longitude. It thus provides a much improved navigational capability, that has only been recently supplanted by modern devices such as the gyrocompass and the Global Positioning System (GPS).